A magical random number generator has decided that Kelly Garbato is the winner of scrumptious chocolate goodness. Congratulations, Kelly! Thank you to everyone that shared their pittie stories! I loved reading them. 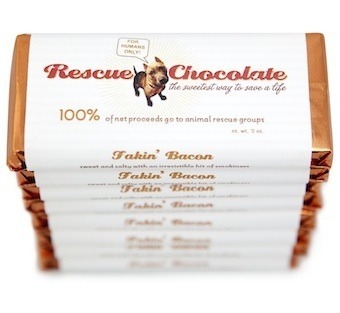 Rescue Chocolate (“the sweetest way to save a life”) donates 100% of the net profit of every chocolate bar sold, to animal rescue organizations throughout the United States. Oh and 100% vegan- yes! I don’t know about you, but I certainly don’t need an excuse to buy chocolate. However, doing something good while buying chocolate- well that’s just the best. Isn’t it? Saving lives. Eating Chocolate. All in a day’s work. 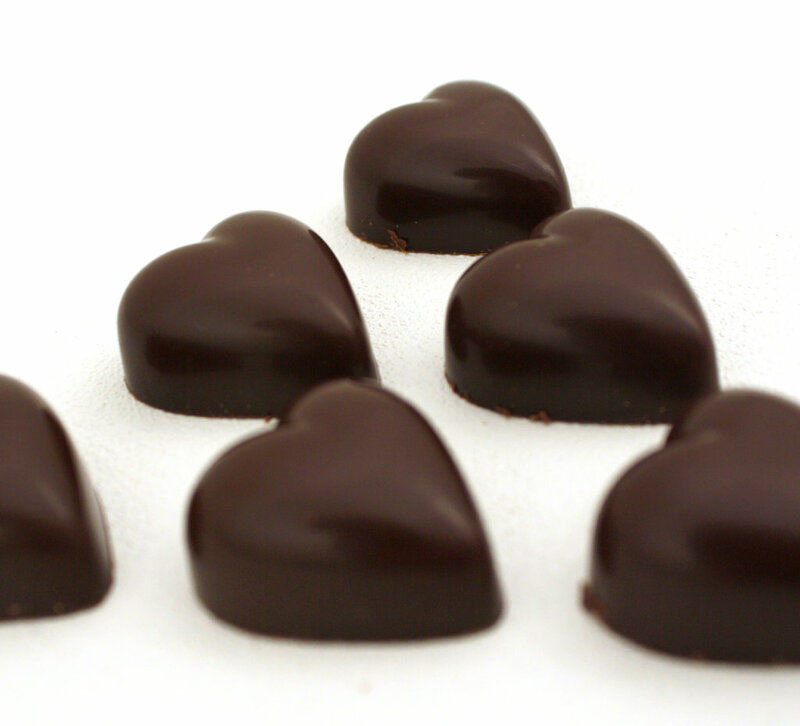 Perhaps your true love is the raspberry ganache-filled chocolate heart. 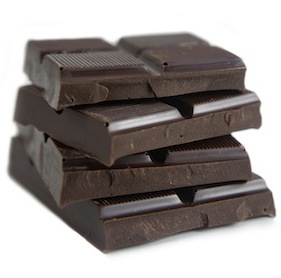 Or you prefer a treat of minty dark chocolate with cacoa nibs. Maybe your tastes go for the salty, smokey Fakin’ Bacon chocolate bar. Whatever your chocolate preference, Rescue Chocolate is offering a $25 gift certificate to spend at their online store. Sweet! In honor of Pitbull Awareness Day and this lovely chocolate giveaway, we asked folks over at the Post Punk Kitchen forum to post photos and stories of their pitties. 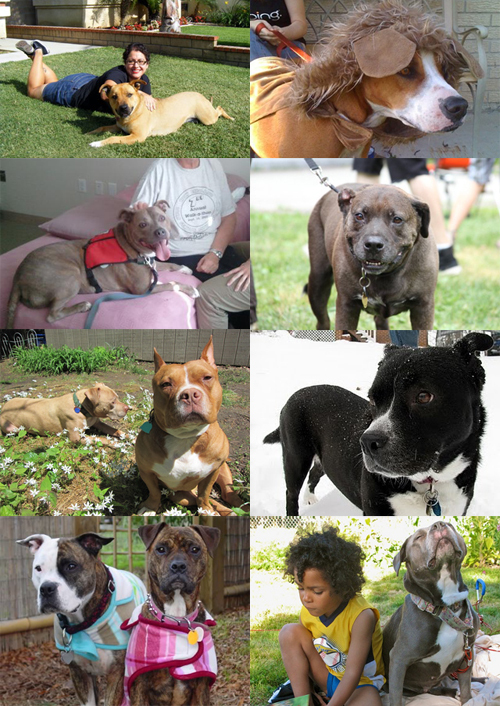 VeganMoFo crew’s own Katie put together the resulting collage of beautiful pittie faces. Thanks, Katie! Be sure to check out the heartwarming stories about these gorgeous dogs here. Really. Go do it. I dare you not to tear up a little. Clockwise from top left: Penny, Chester, Mr. Cuddles, Julie, May, Norton and Bonneville, Fiona and Carmine, and Blueberry. 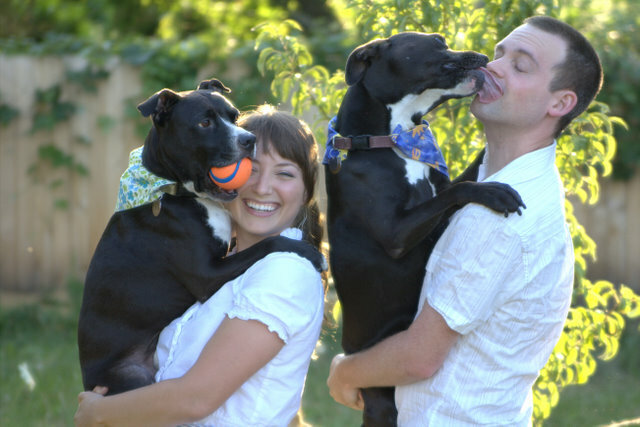 And of course, I couldn’t pass up the opportunity to share my favorite family portrait of me, my partner, and our two pittie boys, Andy and Emerson, who have brought so much joy into our lives. To enter the Rescue Chocolate giveaway, tell me about your favorite Pittie in three sentences. (If you don’t personally know a pittie, seek inspiration from the PPK stories.) A winner will be chosen tomorrow morning at 11:00 PST. The winner will be contacted via email, so be sure to include your email address in your comment. This giveaway is open to people in the US only. UPDATE: It appears there was an issue with people being unable to comment on this blog earlier today. The problem should be fixed now. We’re extending the giveaway until 6:00 p.m. Sunday! Awwwww. Your picture is so sweet. I have a friend who rescued a beautiful pitty girl two years ago. She is spoiled rotten and sweet as can be. Maddie joins us on the hiking trail often. I forgot to leave my e-mail. vegintraining at gmail dot com. I don’t personally know any pitbulls, but I think that dogs are great, and that pitbuls in particular often seem to get an undeserved bad reputation when really the human guardians who trained them are at fault. Thanks for the giveaway! There is the most adorable pitbull that comes to the dog park where I take my dog. She is so sweet and super friendly. Perfect advocate for the breed! One of my babies is a mix that includes some pit bull – he is my favorite. But if I had to choose a favorite pure pit I would choose Hercules from Pit Boss on Animal Planet. Or any of his dogs/rescues. My favorite pitbull went by the name of Jezzy. Let’s just say that she was so “Miss Manners,” that whenever she tooted, she ran out of the room, completely embarrassed! Hahaha. I miss her. If only some men I dated had the humility she did. Shadow, one of my childhood/early adulthood dogs, was the sweetest girl you could ever hope to meet, even though she’d been horribly abused and mistreated before coming to live with us. When I relocated from NY to the Midwest w/my now-husband, it was Shadow I missed the most – more than any of my human relatives – because I knew I wouldn’t see her many more times before she passed. She died three years ago this November, leaving a pit bull-sized hole in my heart. That really touches my heart. I’m sorry for your loss. I really love pitbulls. They are amazing, loyal, beautiful,and friendly dogs. I would really enjoy rescuing one from a shelter. 🙂 Thanks for the great giveaway! I’m waiting until my life is finally stable enough for a pitbull, but I had the joy of living with a pitbull in a summer sublet once. Pedro was pretty terrified of everything, including me, even though I offered him a treat most of the evenings I came in the door when I got home. But when it rained, he was more terrified of the rain than me so he’d emerge from his owner’s room and jump on the couch next to me and lean up against me as hard as he could for comfort. Mind you, Pedro weighed only 15 pounds less than me at the time. So I was squished up against the edge of the couch with this giant pitbull snugging on me for comfort. I miss our special moments now that we don’t live together. Unfortunately, I don’t personally know any pitbulls, but I loved reading the posts at the PPK. It is so sad that many of these dogs are abused and/or abandoned. It is clear that they have a HUGE capacity for love that is fully realized once they have someone to share it with. Just look at those beautiful pictures! My rescue pit-lab mix, Nestle, is the first dog that I have ever had. She is smart, hilarious, patient with her little bro (fittingly-named Boomer), and the best snuggler. Like all of us (the MOFOing crew, that is), she is also a foodie… with a penchant for carrots, a preference for Macintosh apples (yes, she can tell), and a willingness to do anything for peanut butter. My grandma had a Pitbull named Salty. She was a really sweet dog and I always remember her greeting us kindly when my brother and I would visit. She was a very intelligent dog that I will always think of fondly. My favorite pit bull has to be Reggie, formerly at Berkeley Animal Care Services, since rescued by Healdsburg, and I think now adopted. He’s a gorgeous white and brindle boy with tons of energy and a love of life. I chose him to be the dog I walked for my orange level at the shelter. He just wanted to jump up and love me to death. Sometimes I’d take him out to the play area and while he would chase balls and toys, he wanted even more to sit in my lap and nibble on my hair. We’d cuddle a lot on walks. I didn’t have a dog of my own at the time, so I loved having a cuddle buddy. I’m still a little sad I wasn’t able to take him into my home, but I’m sure he’s got a great situation now and I hope he still remembers me. My friends have the sweetest pit bull, She’s an old lady and has arthritis, She never barks or bites or looks threatening at all. So take that, pit bull haters! My friend owns a pittie who was rescued from being the bait dog in a dog fighting ring. The poor girl was too gentle to fight, so she just was tortured. Now, she has a lot of scars and looks a little mangled, but she is just the sweetest dog you could want. The only danger she poses is snuggling you to death. She is a lovely lady and I am lucky to have known her, even though I haven’t seen her in a long time. My friend owns a little rescue-pit, and she is ADORABLE. Super sweet, high-energy (awesome playmate!) and great comic relief. She’s also the best snuggler I’ve ever met. Take that, past boyfriends. Jethro, he’s a big white floppy pit, still walks around dragging his giant feet like a pup. His best friend was a little jack russell, even though the russell didn’t think so 🙂 He could melt even the coldest heart. Bronx is the sweetest little pittie anyone could meet. His golden tan and purple eyes are absolutely breathtaking, and he has a personality of a playful 3 year old human. He has had many adventures around my small town in Illinois, meeting lots of neighbors and a few police along the way. He just loves to be outside as a free spirit roaming around the pond, paths, trees, and any people who he may see. He rubs up against your legs before sitting on your feet staring up at you until you talk baby talk to him and pet him. His smile will melt your heart! My favorite was my 4th grade teacher’s dog. She used to come in to visit! She only pooped on the floor once. My brother’s roommate has a pit bull. It’s the most energetic dog I’ve ever known and a very enthusiastic licker of anyone who comes near. Warning: if you leave it alone with any of your things, even for a few minutes, it will chew them to unrecognizable parts. My cousin use to have one. He was such a loyal dog. He took him eveeywhere. Very affectionate and lovable. I don’t personally know any pit bulls, but I have been seeing more and more around Seattle, which makes me happy. Also, one of my classmates is starting a pit bull rescue project which I think is awesome! This is a true story. My brother in law rescued a pit bull. He adored it. He loved it. So much so that when Spike passed my BIL blew up a picture of him and framed it with Spike’s skeleton. True. I’ve never had any pitbulls in my life personally, but I’ve walked dogs at the SPCA and the pitbulls are always so sweet! A lot of them have been dumped there just for being pitbulls, which is so unfair. Even finding foster homes for them is hard sometimes. Rescue organizations are so important! Love rescue chocolate! I was gifted a RC peanut butter pitbull a year ago, and it was divine. and since i havent had the pleasure of meeting any pitbulls personally, i will go with that as my favorite pittie! My friend from high school really loved pitbulls, and his was the first that I ever met. And what a sweet, gentle creature! These dogs are amazing. Don’t own a pittie, yet I know one. She belongs to my friends, S and S, and “Miss Sophie” is a diva in every way. Has her own little diva beds, one in the house, and an outdoor spot out back. She’s a bit less frisky, as she is past 10 doggie years now, yet still manages to convey, by her walk, and the way she ‘inserts’ herself into whatever is going on, that that is her domain, and we’re just visitors there. I’ve never met a pitbull, but I do see one on my daily walks who gets mighty excited when I walk past his turf! Moo Cow is a 45-lb kiss. She’s vegan and sometimes smells like Tings. She loves to tumble, fetch, snuggle in the shape of a number 6, and will greet you with her tail of joy. I don’t own a pit-bull, but, I go camping with a family who does. Her name is Kisa. She is absolutely, one of the sweetest dogs I’ve ever met. She is completely obsessed with her ball, and doesn’t let it out of her sight. I wrote a haiku about my favorite pit bull. Hope that counts as an entry. I love these chocolates. I don’t know any pitbulls, but I did volunteer one summer at my local animal shelter. I walked one older female pitbull with arthritis. She was so sweet, but I so sad she wasn’t getting adopted. I’ve only been owned by Rotts and Shepherds (to date) and while I’ve met many Pitties while walking my dogs, as well as when I volunteered at a local animal shelter, my favorite one is all of them as each and every one of them are very special imho. Since I have my own lovely pit mix, I feel like I already won. I’m glad this giveaway brought out so many lovely stories about these wonderful creatures who are often given a bad name. Before Penny, I would look longingly at fancy pure bred dogs but now I know it’s pitties and mutts for life. If she could read this, I believe she would snort in agreement. The collage came out great Katie, I’m glad to be included. I love pitbulls. I love peanutbutter. I love pitbull inspired peanutbutter pitbull vegan chocolate bars. I can’t pick a favorite pittie! I’ve seen quite a few come through shelters I’ve worked/volunteered at. Current favorite is a darling red and white girl named Marilyn–she’s a doll! My favorite pit bull is one of the rescued Michael Vick dogs (Vicktory dogs) from Best Friends Animal Sanctuary. I saw the Dogtown show on tv and fell in love with Georgia the red pit bull with no teeth. She has also been on the Ellen DeGeneres show and always carries a bone in her mouth. I have a black and white pit bull mix named Lucy. She is loyal, sweet, and super energetic–and she loves vegan food! Her favorite fruits and veggies are cabbage, broccoli, carrots, blueberries, and bananas. My favorite pit bull is named Emmett. He has a widow’s peak and is so calm, cool and collected that he doesn’t mind when my bad-mannered corgi mix throws him shade. This unique inner peace is what makes them great dog friends. These are so cute! My best friend has 2 dogs that are part pit bull and they’re the best! I don’t personally know any pitbulls, but after reading the stories on the PPK forums, I think they are all ADORABLE! Especially Fiona and Carmine (vegan doggies!!) and Henry (the rescued pitbull who was starving :() It’s great to see animal lovers who rescue these awesome dogs that need lots of loving! I had a neighbor and also friends with pit bulls/mixes. They were sweet and friendly dogs. Thanks for the reminder about the chocolates… Will check out their website! Yay! Fakin’ bacon bar, here I come!